1) Does my cat need more water in the summer? He doesn’t seem to be drinking much. He eats both wet and dry food. How many ounces of water is correct for a ten pound cat? Also is it ok if he sometimes drinks out of the toilet bowl? Wet food has a high water concentration, so he may be consuming enough to keep him hydrated through his food. Or maybe he’s shy and only drinks when you’re not looking! An average cat will consume roughly one to two 8-ounce cups of water per day per 10lbs of body weight (including water from canned food). There are a lot of things that can affect that number on a daily basis, including the heat. But if you notice a consistently elevated amount of water consumption, talk to your vet right away – we all know about the triad of “drinking diseases” in cats (diabetes, kidney disease, hyperthyroidism) which may need to be investigated. Toilet water is not a great source of clean water, so try to keep the lid down. A better suggestion would be to try a cat fountain. Many cats like them, and it can help increase their water consumption. Otherwise, make sure there is always a fresh source of water available, and trust that your cat will know when it’s time to drink. 2) Is there any safe sedative to give to a cat before a two hour flight (traveling with me in the cabin)? It is very rare that I recommend using sedatives for air travel. Individual cats can react very differently to sedatives, so there is no one sedative that is completely safe for every cat. Sometimes sedatives don’t work well at all, and sometimes they can last way longer than your trip. It is imperative that you speak with your vet about the pros and cons of using these medications in each individual cat. I always recommend trying the non-medicinal options first. Get your cat accustomed to the carrier. Leave it out for a few days before travel so she can sniff around. Place some toys in there, as well as an article of your clothing that has your scent on it. Try going for a short drive to get her used to the motion. 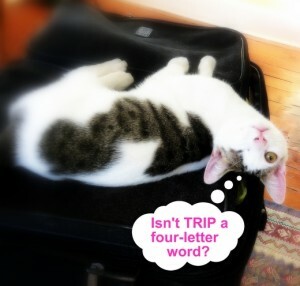 One product that often helps cats with their travel fears is Feliway. Spray it on a towel prior to putting the cat in, and apply it to the towel as needed (never spray it directly on the cat). There are other homeopathic remedies that can help relax cats too, without using sedatives. (Some folks even do Reiki!) It’s important to try some options prior to the day of travel, so that you know how your cat will react ahead of time, and modify the plan if needed. And take it from someone who learned the hard way…bring an extra towel on board and something to clean your kitty up, in case she has an accident. Kitty – and your fellow passengers – will thank you. Great information! We don’t fly anywhere but mommy makes sure we have a glass of water in just about every room. We need to ask for more stinky goodness though! When we had to transport Audrey by plane, we were most concerned about going through security, nd we were right: she did freak out then. The vat had said no sedative, but did say we could give her childrens’ benadryl. We decided not to try that, and went cold turkey, and I forget what dosage she recommended. Did you get my email about winning the necklace giveaway? The comment you left on my blog was too funny! Thanks for stopping by! Purrs. I worry about the boys not drinking enough, even though there is plenty of water made available at various locations in the house (away from their food of course) and out in our little back space. They get a lot of canned, though, and I add a bit of water to that as well, so maybe…But still, they are at high risk for crystals, so I worry, worry, worry. I do watch to see if Austin is getting enough water – or drinking too much! It is right they get quite a lot of moisture from soft food, which is why I give him both hard and soft. I really try not to drink and fly!!! That is a great post with lots of good info. The cats around here seem to drink plenty of water. Also they get liquid from the canned food. I don’t have to worry about sedating any of mine because they will never be going on a plane trip. That might be kind of tricky to do. Have a great day. Great and informative post. 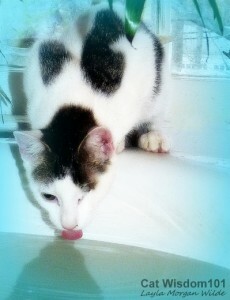 I am always obsessed wondering if my cat is drinking enough water. I do feed him both wet and dry food and I am happy to read that for a cat his weight he probably only needs approx 8 ounces of water. Hi, I’d like to thank you for coming to visit Dante. You said you found him through Mr. Puddy — we just love Mr. Puddy! I notice that you have a tuxy kitty named Domino. Well, so do we! 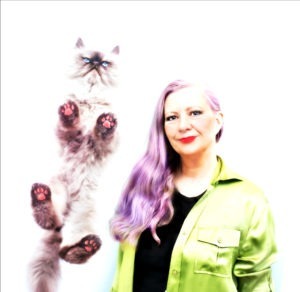 I have another blog with all three of my cats called “Wendy’s 3-D Cats” at http://wendys3-dcats.blogspot.com. It’s always nice to have new friends. Thanks for being the newest Dante admirer! Domino is part ragdoll but i do love tuxies and will stop by.